At Capt Hiram’s, we believe vacationing should be the easiest thing you ever do. After all, what more do you need than a cold beer (or perfectly poured scotch), fresh-caught seafood, warm sand, palm trees and a tropical breeze? 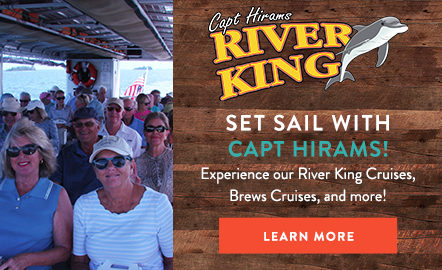 This, plus a collection of 86 guest rooms and suites with romantic river views, live music, riverboat tours and a full-service marina, has made Capt Hiram’s one of Florida’s most unique and beloved destinations. Magically transporting its guests to “island time,” this laid-back Sebastian resort captures the essence of the tropics. Don’t believe us? Have an order of Mickey’s Oyster Shooters and we’ll talk. A nod to our history…. Capt Hiram's honors the memory of Sergeant Hiram Collins, a brave World War II soldier and great uncle of owner Tom Collins, who was killed at Normandy Beach. 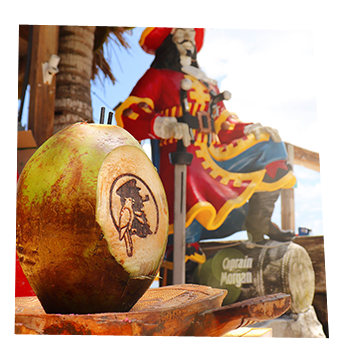 The evolution of Capt Hiram's as a waterfront resort and restaurant is a unique story. 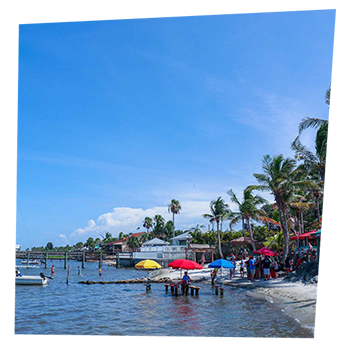 The property was purchased by Tom Collins in 1986, who partnered with Martin Carter and Jimmy Hoffman to open what was then known as Sebastian Inlet Marina. Since then it has grown from a small marina into the area's largest waterfront resort and restaurant. Capt Hiram's River Raw Bar opened in 1987 with just 28 seats and has expanded continuously over the years, now accommodating more than 500 guests. In the mid 1990s, the Sandbar was added and that casual part of the operation has continuously expanded, most recently with the addition of the Coral Bar, Scoops, Bimini Beach and the Grand Sand Bandstand. The marina has also evolved over the years, growing from a facility with 14 boat slips to today’s full service marina, with 60 slips, our ship's store and transient facilities for our boating guests. Hotel rooms were the next logical step, originating in 1994 with the construction of four Captain's Quarters rooms, located over the ship's store. The success of these rooms led to the development of the Riverfront Building, which opened in March of 2004. Today, owners Liz and Mickey Capp continue the tradition of gracious hospitality that began, quite modestly, in 1986.